Let us begin with the events that happened prior to the ceremony. We were looking for Mario in Rio de Janeiro throughout the beginning of April, but we failed to find him. However, he would return to Rio de Janeiro in June, which you may know as Mario & Sonic at the Rio 2016 Olympic Games on the Wii U. A fledgling force in Team Koopa would show up there as well. 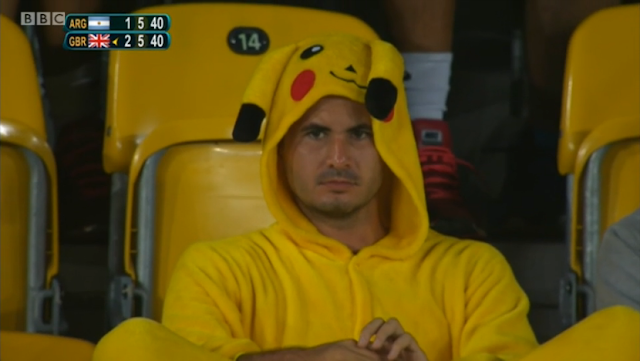 While we failed to find Mario, at some point, we did spot a guy in a Pikachu suit. The night before the Opening Ceremony, all of Team Koopa's members left Brazil and returned to our own world. The Koopas did not verify that Mario would follow, but I hoped he would. I didn't want him participating in the Olympics and winning medals, after all. Evidently, he did not return to his own world, and remained on Earth. It is unknown if the rest of Team Mario remained as well, or if they did the right thing and left. 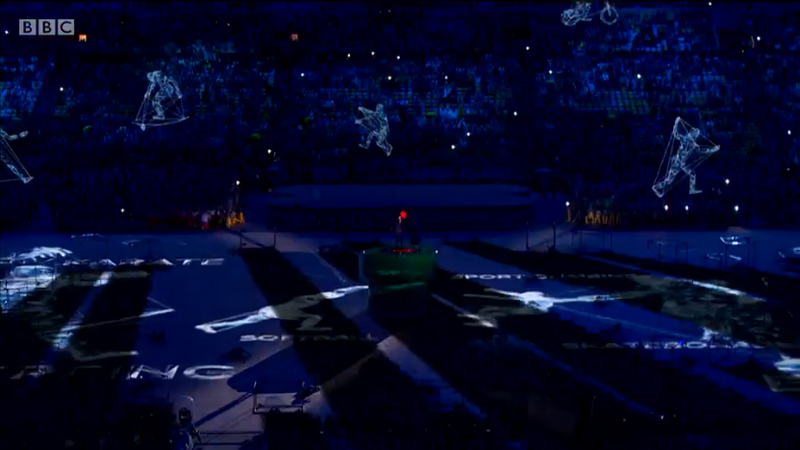 I hypothesise, but cannot prove, that Mario was committing some kind of vandalism crimes similar to Ryan Lochte while he was still in Rio de Janeiro after the Opening Ceremony. However, he would not remain there for long, and was deported out of Brazil to Japan. We believe that Mario, whether by his own stupid actions or forcibly by the Brazilians, fell victim to a rare, undocumented forme of the Zika Virus. Instead of increasing the rate of Microcephaly in your babies, it shrunk the existing Mario's head — and the rest of him — into something quite small. Alternatively, he accidentally ate a Poison Mushroom. You can't trust the health standards in Brazil. Perhaps he ate at the Bin Laden Bar. Regardless, all that was left was his cap, which shipped to Tokyo, Japan. That explains why the cap read TOKYO. It was the shipping label. 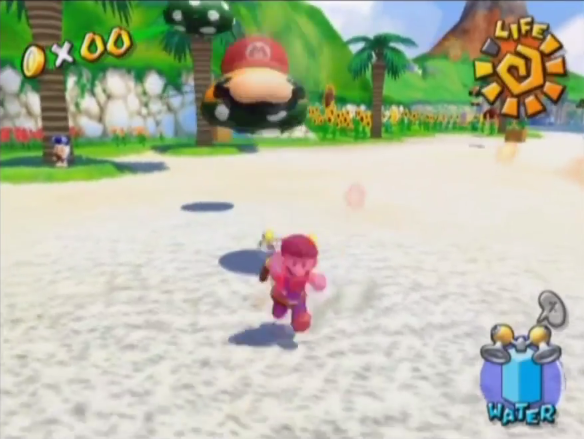 Swipin' Stu forcibly slams and merges with Mario's Cap in Super Mario Sunshine. 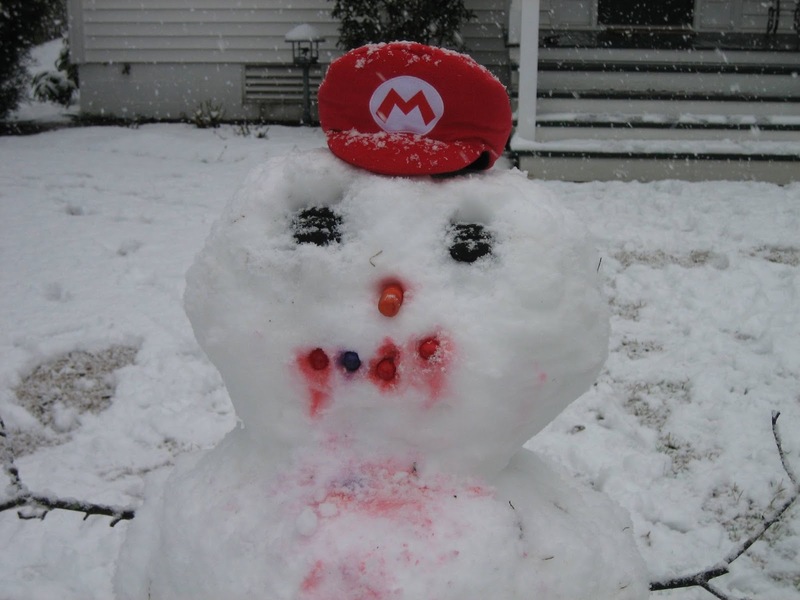 Without his headwear, Mario steadily loses his life energy. This is the case even under the shade of those trees, so it has nothing to do with sunburns. Mario also takes DOUBLE DAMAGE in Super Mario 64 when he's without his hat. Clearly, it protects his soul. And no, just putting on the hat under normal circumstances won't transform you, like Ukiki taking it. Yoshi transforms into Mario because he ATE the hat. That's quite a bit different than the Goomba just wearing it. Well, no, that's not a 100% accurate explanation. You see, Yoshi did not transform INTO Mario, but simply into his...figure. Yoshi still sounds like Yoshi, but he has Mario's abilities. It's unclear how much free will Yoshi retains, but we believe it is a struggle to stave off Mario's impulses once he has control of you. Mario himself still exists in the same world, independent of Yoshi and Yoshi in Mario's form. And this would not be a strange thing for Mario and what is basically an imperfect clone to co-exist. After all, there are such things as Double Cherries. However, Shinzō Abe was going to be late to the Closing Ceremonies, which would be very dishonourable. I don't know why he wasn't there the night before, but I imagine that Shinzō Abe is a Night Owl and ended up in a very similar situation to Jean-Paul (who missed THE OLYMPICS...!) from Seinfeld. Probably a timezone problem. So Shinzō Abe rushes to his limo, panicking. 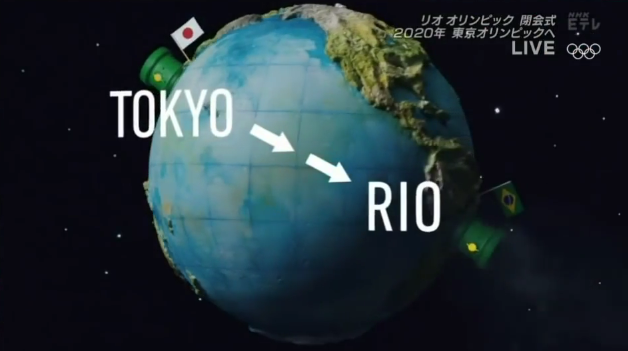 He's likely planning to take a supersonic jet to get to Rio, since all of the bullet train tracks in the world ain't gonna get him there in time. And what's in the limo? Mario's cap. 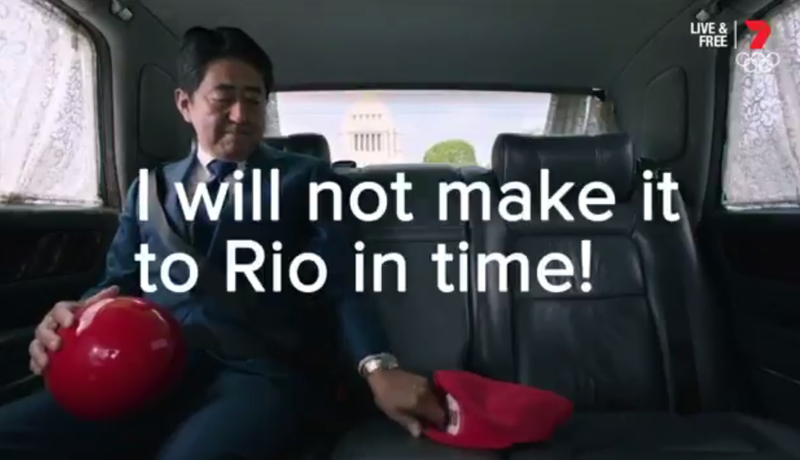 Shinzō Abe, in all of his nerves, grabs Mario's cap as a sort of desperate comfort object. You know the rest. Just look at Shinzō Abe's face. He's clearly unhappy with the situation, and he latches onto any object in the vicinity. With all of the force of an incredibly nervous leader of a glorious nation, he merges with the hat and transforms into Mario! ...And he was promptly ejected from his limo, because the limo is for Shinzō Abe only, not for intruders. And thus, Mario had to run on foot. I would note that this was unintentional on Shinzō Abe's part. Running on foot as a fatass plumber is slower than taking a limo, and if Shinzō Abe could transform into anyone he wanted, why would he pick Mario? He could've easily picked Sonic the Hedgehog, who also had vast experience knowing where Rio is. After all, Sonic is the other half of Mario & Sonic at the Rio 2016 Olympic Games, and is a lot faster. Fortunately for Shinzō Abe, Japanese hero and symbol Doraemon appeared from the future to plant a warp pipe for the unseemly prime minister. Doraemon knew, in his wisdom, that Shinzō Abe is Shinzō Abe, not Mario, and thus he helped his prime minister. Out of duty and loyalty, as a good Japanese citizen would. It was a very wild journey and at the speed of light, but they made it. Due to all of the turmoil of going through the whole planet, when Shinzō Abe popped out of the warp pipe, his Mario clothes disintegrated right off of him. The hat remained, but Shinzō Abe fought the control of the Mario essence and dropped it. The hat is on the warp pipe rim, and would mysteriously disappear. 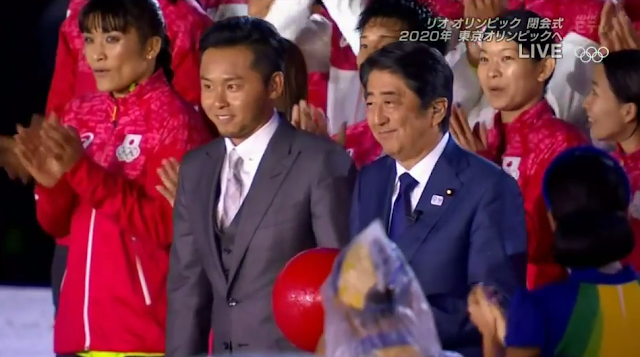 Somehow, Shinzō Abe hid behind special effects, and ended up in the crowd. What happened to the Mario gear? We assume it fell into the warp pipe and is back in Tokyo, waiting to take over someone else. Eventually, it should end up back in the Mushroom Kingdom, and the rest of Mario's body with it. “See you in Tokyo!” mouthed Shinzō Abe as the last we'd see of him. And if that was a real-time statement made by him, his speech was incredibly garbled. It is obvious why Mario wanted to come back to Rio. He wanted revenge after being ejected from Brazil. I mean, he's a pretty vengeful guy. It turns out that his goal and Shinzō Abe's coincided, and the ends justified the means. He's still out there, at large, somewhere in the world. He's literally an illegal alien. If you see Mario or his hat, do us at Koopa Kingdom a favour and shred it. Be vigilant. This is no time to relax. You guys at Earth now get to feel how us at Koopa Kingdom usually do, so maybe y'all can develop some empathy. Be careful: He may show up in the most unlikely of places and take the most unlikely of formes! Ludwig wonders if Shinzō Abe has completely removed himself from Mario's control. Japan needs to stay a country that KoopaTV favours, not a puppet state of the Mushroom Kingdom! Vortexica and RawkHawk2010 contributed pictures, the .gif, and information. This article was a team effort to put together! (Don't ask about Kamek or Wendy.) This is KoopaTV's 900th article. Let's hope Luigi's hat doesn't have the same effect. Mario is already proven to be a body snatcher, so this isn't new for him. This article actually is the predecessor to an actual new game, Super Mario Odyssey. KoopaTV's groundbreaking analysis here lead to Super Mario Odyssey's creation. Horrifyingly, Mario can throw his cap, named Cappy, at defenceless people and capture their bodies. Super Mario Odyssey has been released, and the fact that the article you're currently reading exists means that KoopaTV has been covering it prior to its announcement. The only logical explanation is Mario is an alien shapeshifter from another dimension. How else was he able to survive the lack of oxygen in Super Mario Galaxy 1&2? Plus, in Super Mario Maker, he can transform into hundreds of different characters with the contact of a mysterious mushroom. Mario, go home and never come back! Maybe we can get him in a New Mexican landfill. I'm amazed you thought of the connection. I forgot about that DS remake along with the hat mechanic. I forgot about it too. I don't even call it by its actual name. Rawk remembered/thought of it, and I asked him to make the .gif. And so he did. I saw it, but no comment.